I confess I have a chocolate addiction. Easter candy is my favorite hands down. I love Reese's Peanut Butter Eggs. It's the peanut butter to chocolate ratio, according to a friend. I think she's right. So when Hershey's sent me this basket full of Easter candy, I was excited. Just behind the Reese's PB Eggs on my list of favorites are Cadbury Mini Eggs (the candy-coated kind). I may have 3 bags of those in the house right now. Growing up my mom always had a bag of the candy-coated Hershey's Eggs "hidden" in the house and the Cadbury Mini Eggs are very similar so I guess my mom's choices have rubbed off on me. The mini Robin Eggs (colored Whoppers) are sentimental favorites. As a child (or maybe earlier this week), I would lick them and then use them like lipstick. I was cool like that. Side Note: I prefer the mini Robin Eggs over the regular size. Just letting you know. Honestly, most of the candy in my basket will be shared with others. Between my nephews & nieces and my coworkers, I will move it out of my house and beyond my reach very soon. The rest of the candy will either be consumed by me, myself and I OR used to make some Easter Sunday desserts, like these brownie cups. I just mixed up a box of brownie mix and put the batter into cupcake pans and baked as directed. About 15 minutes into the baking time, I pushed some of the York Peppermint Pattie Eggs on the top of about half of the cups and let them finish baking. This is how they turned out...yummy! On the other half of the brownie cups that I left plain, I dabbed a bit of chocolate frosting on them and added 2-3 Whoppers mini Robin Eggs. This was just a test batch that I made with a small box of brownie mix (made 10 brownie cups). After I taste tested a couple of them, I packed the rest off to take to my mom's today for snacks for my nephews and niece who are hanging out there while on spring break. I'm definitely going to make a bigger batch this weekend and I think they'll be a hit at Easter brunch (yes, we serve dessert at brunch). If you want to see other great Easter tips, hop on over the Hershey's Bunny Trail! Note: Hershey's provided me with a basket of Easter candy. The opinions, photos, thoughts (and love of Easter candy) in this post are my own as usual. In the last six months or so, something happened that took me by utter surprise. Looking back, it shouldn't have been so shocking but it was. I had moved firmly into wearing my "one size bigger pants" full time. It wasn't an occasional visit with them when I had too much pizza the night before. It was an extra 10 pounds that I had never seen before. I decided I needed to do something about it, but with an hour commute one way 5 days a week, a tendency to avoid fruits and vegetables and a deep love for watching bad reality TV shows at night, it's hard. I have to admit, I haven't hit my fitness stride yet. Meet Fran, my Fitbit One wireless activity and sleep tracker! Cris over at Goodeness Gracious introduced me to the Fitbit through her Year2Change challenge. 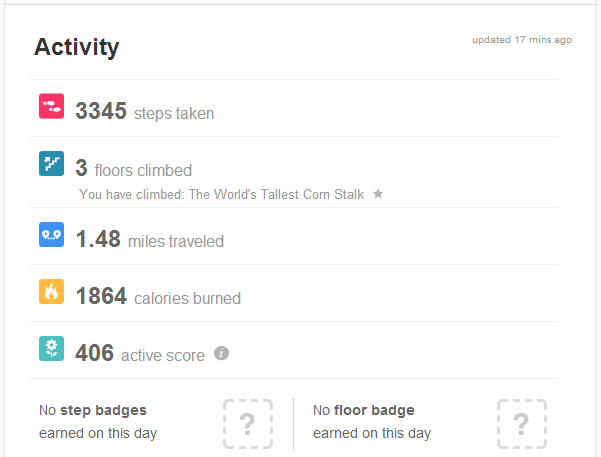 Fran not only tracks my steps...as you can see I need to start moving today. She also tracks the floors I climb, miles I travel, and calories I burn. If you have later model iPhone or iPad, it has some great additional features. I don't but I do have the ability to update my Dashboard wirelessly on my laptop. 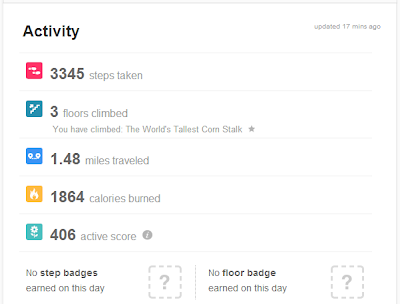 I deliberately did NOT change my activity level during my first week with Fran. I wanted to have a realistic baseline of how much I do actually move in the course of a week. As you can see my Monday activity level was embarrassing! I definitely need to learn to get up and take a couple of laps around the office during the day! Wednesday was MUCH better because I had a couple of events outside the office that kept me on the move, as well as up and down some stairs. My Saturday was OK. I didn't break the 10K steps mark but I did go climb some serious stairs (more on that later). It's been interesting tracking all of this and it's definitely a wake up call that I need to start moving more. For now, I need to come up with a solid, workable plan to get 10K steps several days a week. Once I have that established, I think I'll tackle the food tracker that the Fitbit Dashboard has...oh I'm not looking forward to that! Fran, the Fitbit 1, is not a cheap new friend (I had some Amazon points to burn) but I think she'll be true friend for many years and be the support system I need to get my act together so I can retire my "one size bigger pants" once and for all. 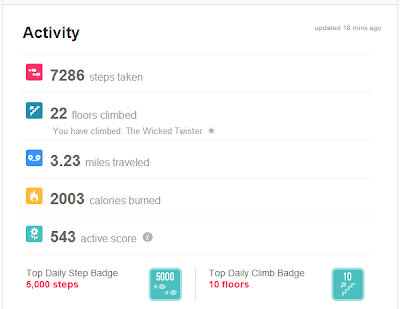 NOTE: The link to the Fitbit One in this post is an affiliate link. The opinions in this post are my own - no one else wants to claim them. So I have been AWOL over here on my blog for a long, long time...like almost a month and a half. Yes, I traveled a lot during February. Yes, I had some long days at the office. But honestly, I just got into a late winter funk. While I was on my hiatus, some great ladies in the Blogosphere were re-launching a wonderful site that I want to be sure that you go check out. The Real Farmwives of America and Friends is a virtual smorgasbord of great recipes, clever photography tips, fun home & garden ideas and, my favorite, profiles of some cool farmers from across the country! In full disclosure...none of the farmwives look like the three gals above but we like to think that the fun illustration has pieces of all the ladies who contribute to the site. Also, while I'm confessing...I am part of the "and Friends" part of the group so you may see my contributions over there as well! What are you waiting for? Head on over now and check it out. If you want to connect via Facebook, you can do that too! The Real Farmwives Facebook page also includes the feeds from all of the gals' individual blogs as well. How cool is that? While you are getting caught up over at the Real Farmwives blog, I will be putting together some new posts and trying to revive my humble little space out here!